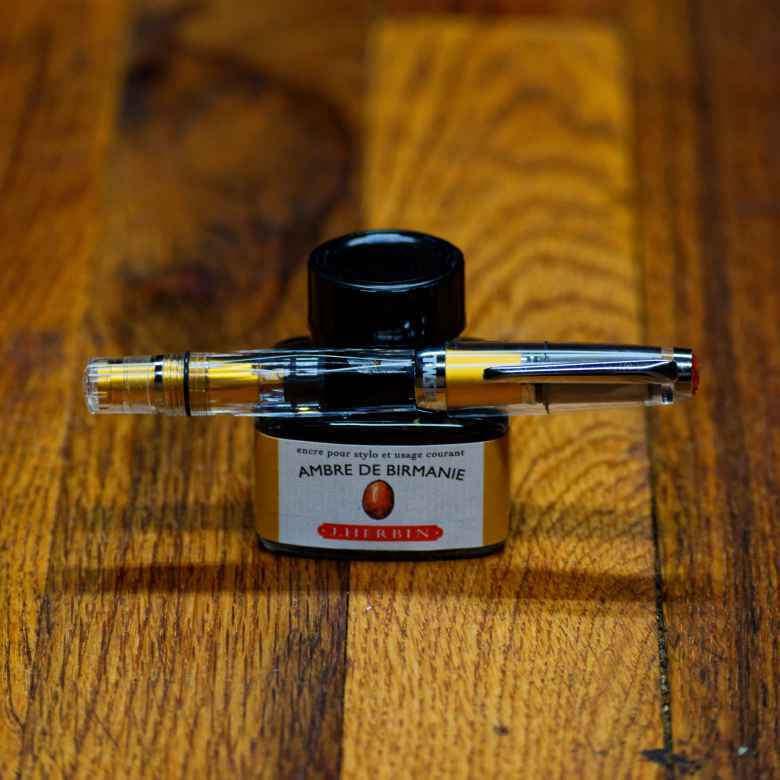 Wherein my Gold TWSBI Diamond Mini AL (IF) is paired with J. Herbin Ambre de Birmanie. On December 9, 2017 my Gold TWSBI Diamond Mini AL (IF) joined its comrades when it was filled with J. Herbin Ambre de Birmanie. The pen was in use for one year and was emptied and cleaned on January 9, 2019 , saying good-bye to its fellows. I’ve long wanted to try a gold ink, and getting the TWSBI Mini AL Gold seemed like a good time to give that a whirl. I don’t expect to really love the ink, so I’ll settle for having had fun with it. I also don’t expect I’ll write this pen dry before I switch inks. Still, I am looking forward to this combination! This pen was sixteen minutes shy of being inked for a full calendar year. I love the nib on this pen, which helped me use up this ink. The ink had to grow on me, as it’s not my usual taste in color. But over time I grew used to seeing it, and looking forward to using my pen. Oddly, the pen has enjoyed a downgraded status, despite its being “gold”. Rationally I should have been somewhat proud to use a “gold” colored pen, but I kept overlooking it. It could merely be my reaction to the ink, but I am amused at my prejudice toward what is an excellent pen, and an attractive pen at that.